Smartphones are our closest companions, we walk, work and play around with them, these cause them to get dirty and no one like it when his/her smartphone gets dirty, but the truth remains that it is inevitable for our cell phones to get dirty as it is subjected to fingerprints and smudges. Kyocera a Japan-based smartphone manufacturer (OEM) has brought a solution to this problem. The company has launched its new smartphone called the “Kyocera Rafre KYV40“: A well-built smartphone that’s not only water-proofed but can also withstand chemical reactions. 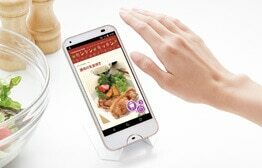 Kyocera Rafre KYV40 bags a cooking app which works with hand gestures. There will be no need of touching your phone before setting alarms, timer and even answering calls. This device can also help with kitchen chores, if you have smart utensils. Landing with 5-inch screen display and 13Mp HDR whopping shutter, Refre KYV 40 lets you take clear photos even at low light. The device is surprisingly armed with Phase detection AF for quick focusing. Some other features of the phone include; A 3000mAh battery, runs Android OS Nougat (7.0), 16GB of internal storage which is expandable to 200GB via microSD card. Unfortunately this device is only available in Japan, but we are looking forth to its entrance to other countries before the year is done. What do you think about this device? Would you happily spend some fortune to pre-order it? Let us hear your opinions in the comment section below.